Hello everybody! Today, I’m going to be doing the Perpetual Page Turner’s Annual End of the Year Reading Survey, even though we’re now almost a full month into the new year. This is mostly because I was more than a bit intimidated by the sheer length of this tag, and as such dithered about whether or not I was going to do it for a REALLY long time. Shout out to Charlotte for finally getting me to just do it! Onto the post! Genre You Read The Most From: I haven’t actually counted, but I’m pretty sure it’s fantasy. It’s a tie between When the Mountains Roared and the Children of Castle Rock, and has been since April. I had very high hopes for the Lost Magician by Piers Torday, because I LOVE the Last Wild books but it was such a letdown for me. I don’t think I’m going to continue on in the series, but I’ll probably continue to give anything else he writes a try. I was so surprised by how much I loved Children of Castle Rock. I really like everything else I’ve read from the author, but I loved this book so much. I got several people really into the Murder Most Unladylike books this year. I read several amazing series starters, but I think my very favourite was Ellen Renner’s Storm Witch. Best sequel would be either Alex Sparrow and the Furry Fury or the Elsewhere Emporium. Best conclusion would definitely be Battle of the Beetles. I’ve only read one of her books, but I think it’d be Matilda Woods if this means an author who’s had books out other years that I’ve never never read anything from. I don’t read very many YA fantasies set totally in a fantasy world, but I really enjoyed State of Sorrow. The Elephant Thief was totally unputdownable. I was so worried about the characters. Probably When the Mountains Roared. Ooh this is so tricky! There are so many stunning covers out there. I think my very favourite belongs to Wild Folk. I feel like I actually know Daisy and Hazel from the Murder Most Unladylike books personally, so them. But Cara from the Year After You if I’m picking a new to me character. Or Sami from the Eleventh Trade if I’m picking a new to me character that I’ve not mentioned elsewhere in this tag. Ooh there are so many I could say for this! Since I’ve mentioned most of them more than once already, I think I’ll go for When We Collided by Emery Lord. I found Are We All Lemmings and Snowflakes really thought provoking- it discusses some really interesting ideas. To All the Boys I’ve Loved Before, or maybe Under Rose Tainted Skies! The passage where you first meet Fergus properly in the Children of Castle Rock. According to Goodreads, the Mystery of Me was the shortest and State of Sorrow was the longest. I really enjoyed both. The twists in Beyond the Odyssey were mind-bending, and definitely shocked me. Up till December, it would have been Finch and Hector from Flying Tips for Flightless Birds, but Cara and Hector from the Year After You stole it at the last minute. I think this has to be the friendship between the main group in either the Children of Castle Rock or the one between the young explorers in Explorers on Witch Mountain. Both my ultimate favourites of the year were by authors I’d read previously. I would never have picked the Elephant Thief up if Louise hadn’t told me it was brilliant. Matt from Open Road Summer. A singer-songwriter who’s caring and compassionate and romantic? Be still my beating heart. I think this has to be Sophie Anderson’s the House with Chicken Legs. It’s such a unique and compelling book. Most vivid setting definitely goes to Jess Butterworth for When the Mountains Roared, though another great one was Katherine Woodfine’s Paris in Peril in Paris. I think my favourite fantasy worldbuilding was A Darkness of Dragons or Storm Witch, because those were both exceptionally well done. The Children of Castle Rock was a joy to read. I used to think I wasn’t a big crier at books but talking about what I read more since I started blogging has taught me that I cry at basically everything. I think When the Mountains Roared made me cry most though. I really wish a Darkness of Dragons got a bit more love, because it’s so good and I only know of about two other people who’ve read it. Fierce Fragile Hearts crushed my heart at numerous points, and then put it back together. So did the Year After You, but I’ve already made my love for that very clear, I think! I know everyone has said Floored for this and I really did try to come up with something else, but Floored. You can’t get much more unique than a book written by seven of UKYA’s biggest stars, can you? I remember being livid while reading the Buried Crown on behalf of both George, darling Spud the dog and Kitty because some of the people in their town were vile to them. Because I am indecisive, I have numerous answers to this. I don’t really follow many bookstagram accounts, so I’ll leave that out. My favourite new blogs I’ve started reading are Alyce’s and Rachael’s. I share a lot of opinions with both of them, and I’ve really enjoyed reading their content and interacting with them since I found their blogs. For booktube, I’ve absolutely been loving Books and Lala! I think it has to be my review of Staying at Tamara’s, because both George Ezra and this album mean a lot to me. My top 3 has completely changed bar one song, but I still stand by all the gushy things I said about it. I love this one of Shimmy and Sami’s Silver Lining, and one I can’t find except on my Instagram of Saffy holding the Midnight Hour. I loved MG Chat, which Jess ran on Twitter last year. I really wish I’d managed to make it to more. Winning my UKYABA was a pretty special moment. 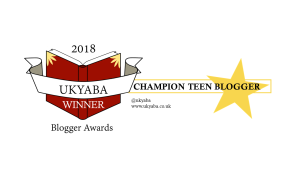 I had been out at a birthday party and came home to discover I’d won Best Teen, and promptly burst into tears. My health was pretty bad in 2018, and I’m so proud that I managed to keep blogging and reading through what was a pretty difficult year. My reviews post for November/December 2017, though I’m not quite sure why! I wrote a post about how much I love Geek Girl, and I really wish it had done a little better because it was one of my favourite posts of the whole year. I honestly don’t really know for this one? The only book related sites I read are blogs, and I’ve already covered those. The short answer to this is kind of. I completed most of them, and I’m not too fussed about the ones I didn’t because I did other things that I’m happier about than I would have been meeting my original targets. If you’d like to hear more about my goals, you can read the whole post I did about it here. There are so many, but I especially need to stop putting off reading the Frozen Telescope. I’m not going to tie myself down to reading it this month or in any given month, but I really do need to pick it up. When We Were Warriors by Emma Carroll for MG and Happy Girl Lucky by Holly Smale for YA. Also Jemima Small Vs the Universe by Tamsin Winter. Ooh there are lots. I think it would have to be Against All Gods for series ending, but another I’m very highly anticipating is James Nicol’s A Witch Comes True. For sequel, I think it has to be Unleashed by Amy Alward because the ending of Jinxed was exceptional! And A Girl Called Shameless, because I have been waiting on it for SO long. I have mentioned this before I think, but my main goal for 2019 generally is to enjoy it as much as possible and as such I don’t really have any concrete reading or blogging goals for this year except for my Goodreads. Basically, I hope to read a lot of really excellent books and have a lot of fun talking about them!! I’ve read and really enjoyed several, but I think the one I’ve recommended to most people is the Year After You by Nina de Pass. It’s phenomenal and I fully intend to continue mentioning it all the time in 2019. What do you think of the books I’ve mentioned here? What are your bookish plans for 2019? I’d love to hear in the comments!